For over 25 years, our mission has been to produce the finest organic yogurt around for our loyal customers. We maintain our high standards by keeping our product line simple, while constantly striving to improve that uniquely old-fashioned European flavor that our fans have grown to know and love. Full credit for our fresh and delicious final product goes to our herd of hard-working Jersey dairy cows. 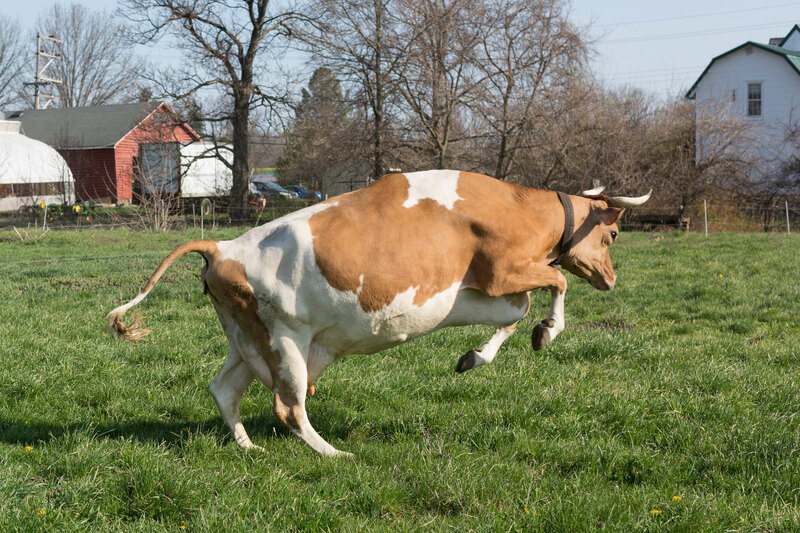 Born and raised on the farm, they get lots of fresh air, pasture, and home-grown feed. Their seasonally grass-fed milk is not only full of protein, but high in butterfat, leaving no need for unnatural thickeners in our yogurt. After the milk is pasteurized, we add live probiotic cultures. The first two living cultures added (Lactobacillus bulgaricus and Streptococcus thermophilus) are needed to convert the pasteurized milk into yogurt during the incubation process. We then add additional cultures (Lactobacillus acidophilus, Bifidobacterium, and Lactobacillus casei) with the goal of helping the digestive system. Scientific research suggests that these probiotic cultures also have a positive effect on the immune system. Made in small batches to ensure both freshness and quality, our organic yogurt is available in four 32-ounce flavors: Whole Milk Plain, Maple, Vanilla, and our newest addition, Lemon! For our customers who prefer a lighter product, we also make Lowfat Plain and Lowfat Maple. Organic maple syrup, organic vanilla extract, organic lemon extract, and cultures are the only additional ingredients added to our unhomogenized, pasteurized milk. With a host of nutritional benefits and four distinctive flavors, our yogurt is the perfect way to start your morning. It can be stirred into a bowl with granola and berries, blended into smoothies, or just as easily slurped directly from the container! Your culinary possibilities don’t end with breakfast, however, with countless any-meal recipes that contain yogurt at one’s disposal. And if you’re in the mood for dessert, we suggest you try our organic heavy whipping cream. In limited regional stores, it’s the foolproof complement to any confectionary endeavor.